No matter that banks from Citigroup Inc. to JPMorgan Chase & Co. have touted U.K. shares, and no matter their cheap valuations. The country remained the most hated region in Bank of America Merrill Lynch’s global fund manager survey in January, with the net percentage of asset managers that are underweight near the highest in two decades. Tuesday’s vote in Parliament may pave the way for a delay in Brexit, effectively avoiding the most-feared no-deal outcome for now. While that would be a welcome reprieve for shares exposed to the U.K. economy, it may not be enough to draw foreign funds back, according to investors. While a delay raises the probability of overturning Brexit, sparking a market rally, it ultimately further postpones investment in the U.K., he added. So far this year, bruised and dirt-cheap local U.K. shares have rebounded, outperforming the more global FTSE 100. An extension of Article 50 would be good news for domestic stocks -- they rallied when the possibility arose earlier this month -- but Tuesday’s vote could test the strength of their recovery. It showed signs of losing steam last week, when the FTSE Local U.K. Index declined even amid gains in European stocks and sterling’s biggest one-week rally in a year. 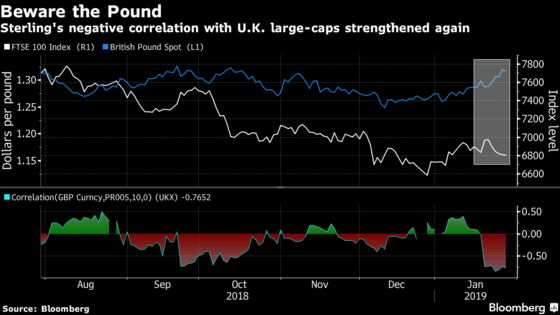 At the same time, the negative correlation between the currency and the FTSE 100 has deepened once again, meaning that any positive Brexit outcomes may be bad news for the U.K. equity benchmark. The index jumped 1.6 percent as of 3:35 p.m. on Tuesday, after sharp losses last week. U.K. funds have seen about 8 percent of their assets under management wiped out since the Brexit vote in June 2016, Barclays Plc strategists led by Emmanuel Cau wrote in a note. While domestic names have rallied this year, short interest in that space remains elevated, they said. Foreign cash matters for U.K. stocks because in Europe, it’s often the marginal price-setting investor. But thanks to Brexit, international funds now equate the British market with political uncertainty and currency volatility. Tuesday’s vote is a prime example: a Brexit delay could rule out a no-deal departure and even pave the way for a second referendum, overturning the first one altogether. But if that fails, the country is left with U.K. Prime Minister Theresa May’s detested deal and a nail-biting countdown to March 29, the scheduled date for leaving the EU. The Labour Party is uniting behind amendments to avoid a no-deal divorce, delay Brexit and push for a customs union with the EU. Meanwhile, May asked Parliament for a mandate to renegotiate with the bloc. Allianz’s Morris-Eyton says Brexit has created some undervalued opportunities in the U.K., though the divorce is the first question international clients ask about. He favors some domestic names with business models strong enough to weather any outcome, such as Rightmove Plc and Auto Trader Group Plc. Brexit has also become an excuse used by some companies, including certain retailers, to explain their weakness, he added. Part of his challenge is to “decipher what is Brexit and what are more serious issues that a business is facing,” he said. Another risk is that companies are now stockpiling inventory to prepare for Brexit, which may erode their margins if they need to offload the goods quickly in the future, said Nick Burchett, head of U.K. equities at Cavendish Asset Management. It’s the old adage: markets and companies hate uncertainty.